President Recep Tayyip Erdogan announced 20 January 2018 plans to launch an operation to rid the Syrian city of Manbij from the YPG after Afrin. Earlier, Turkish President Recep Tayyip Erdogan said that Ankara had "de-facto" already launched an operation on the ground to oust the YPG from the Syrian border town of Afrin. "The Afrin operation has de-facto been started on the ground," Erdogan said in a televised speech in the city of Kutahya, without specifying further. "This will be followed by Manbij," he added, referring to another YPG-controlled Syrian town to the east. Erdogan criticised the United States for working with the PKK, saying they are "trying their best to deceive Turkey and the world." "The PKK, YPG, PYD are all the same; changing names does not change the fact that they are terror organisations," Erdogan said. "They are playing games in Syria in their own way, by changing the terror organisation's name. Who are you kidding? This same organisation's name is PKK, PYD, YPG," he added. Turkey considers the YPG, the armed wing of the PYD, to be a branch of the PKK, which for decades has waged an armed campaign in Turkey that has killed some 40,000 civilians and security officers. Despite the PKK being recognised as a terrorist organisation not only by Turkey but also by the US and the EU, the US considers the PKK's Syrian offshoot to be an ally in the fight against Daesh. 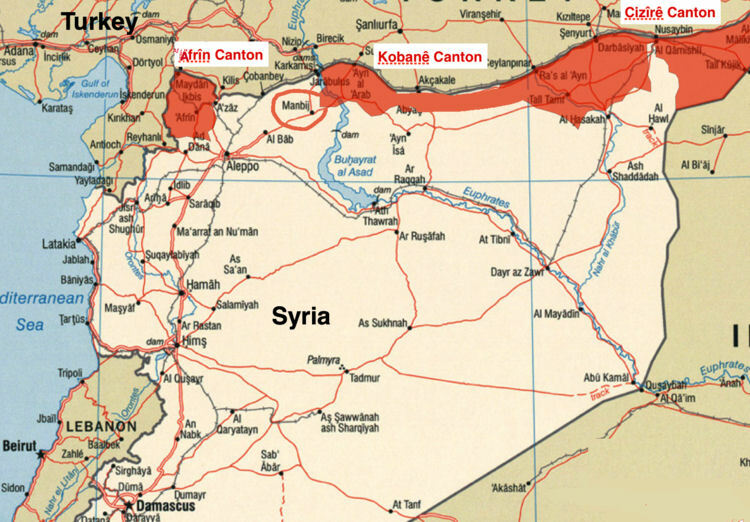 YPG militants comprise the bulk of fighters in the US-backed Syrian Democratic Forces (SDF) militia, which controls a long strip of land in northern Syria along Turkey's southern border. The Turkish military announced it launched Operation Olive Branch in Syria's northwestern Afrin region on Saturday 20 January 2018 at 14:00 GMT. The statement said the operation will also take sensitivity into account and no civilian/innocent person would be harmed. The Turkish General Staff made the announcement in a statement published on its website, saying the objective of the mission is to “establish security and stability on our borders and region, to eliminate terrorists of PKK/KCK/PYD-YPG and Daesh.” The statement also said the operation also aims to “save our friends and brothers” from the oppression and cruelty of terrorist groups, adding the operation only targets terrorists and their shelters, weapons and material belonging to them. It said the operation will also take sensitivity into account and no civilian or innocent person would be harmed. Security officials who asked not to be named due to restrictions on talking to the media said Turkish fighter jets hit 108 out of 113 targets in the region shortly after the operation started. The Minnigh military airbase was among the targets hit by Turkish jets, as well as YPG observation points in the villages of Jalama, Himdia, Hajlar, Fraria and Tal Sallur. The officials added that all injured and dead belong to the YPG. Civilians were given the opportunity to leave the area but the YPG, in cooperation with Bashar al Assad's regime forces, had closed the road from Afrin to Aleppo in a bid to use civilians as human shields, the officials said. The Turkish army also said it launched new strikes against YPG positions in northern Syria, adding it responded in "legitimate self-defence" and hit camps and refuges used by the group in response to fire coming from the Afrin region. 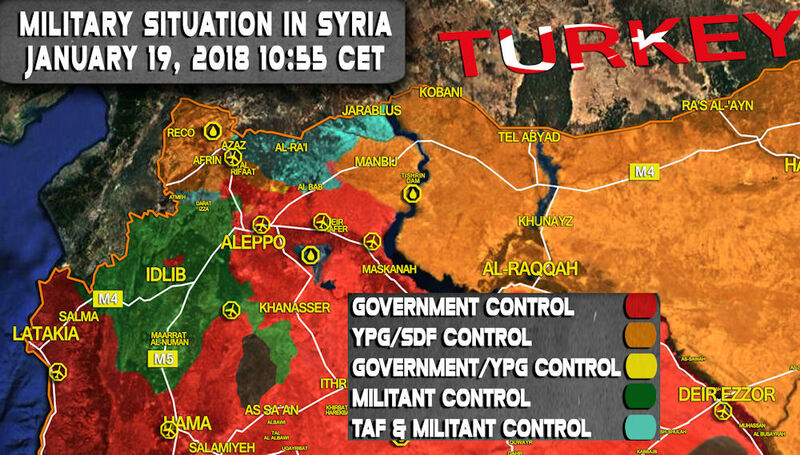 Turkey has repeatedly threatened over the last days to launch a ground operation, also the including pro-Ankara Free Syrian Army, to oust the YPG from Afrin and the area. Turkey's military operation to remove the group from Afrin is just its latest intervention in northern Syria. Turkish troops had already gone into Syria twice in the past two years, but the latest operation presents a new set of challenges. Russia, which itself intervened in the Syrian war in support of Bashar al Assad's regime, said it has pulled out its troops from Afrin and moved them to Tel Rifat for their safety in the wake of Turkey's operation in the area. According to a statement by the Russian Defense Ministry on Saturday, the Russian military administration in Syria took the necessary steps for the safety of Russian forces in the area. Turkish Foreign Minister Mevlut Cavusoglu said that Turkey informed the Assad regime about the operation in accordance with international law. Turkey's army chief General Hulusi Akar and spy chief Hakan Fidan were in Moscow for talks with Russian counterparts on Syria. 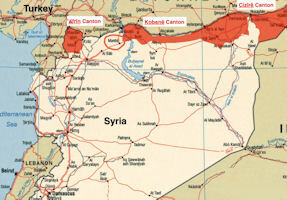 Syria's Ministry of Foreign Affairs stated that Turkey's move was another violation of the country's sovereignty. "The Syrian Arab Republic decisively condemns Turkish aggression against the town of Afrin, which is an inseparable part of Syria," the statement said, as quoted by the SANA news agency. 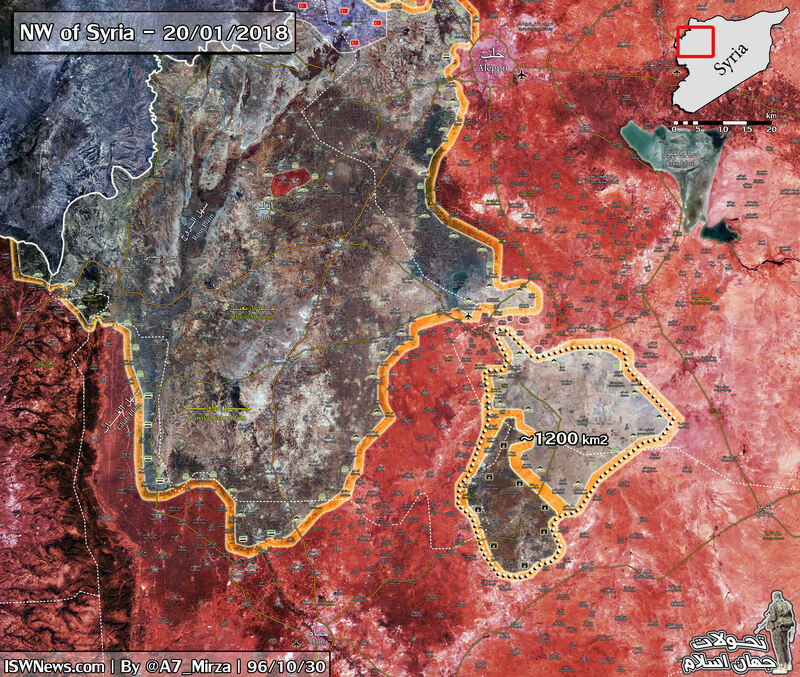 The Syrian government added that despite Turkey's claims Ankara had not informed Damascus of the military operation. "Syria completely denies claims by the Turkish regime that it was informed of this military operation," a foreign ministry source told state news agency SANA. On 20 January 2018, the Turkish Prime Minister Binali Yildirim said that the country's jets have bombed YPG, PYD targets in the Syrian city of Afrin. "Out of 113 designated targets of the Democratic Union Party (PYD) Kurdish Syrian terrorist group, 108 have been destroyed as of 18:30 [15:30 GMT]. All the killed and wounded people, who have been sent to hospitals, are members of terrorist groups," the statement of the Turkish General Staff read. Nearly 350,000 Kurds from Syria's Afrin had fled to Turkey after oppression from terror groups, Turkey's Prime Minister Binali Yildirim said. Addressing the ruling Justice and Development (AK) Party's sixth annual provincial congress in northern city of Zonguldak, Yildirim said Turkey will not allow terrorist organisations on its southern borders. "The Afrin operation aims to end the cruelty of these PKK/PYD/YPG and Daesh terror organisations in the region," he said. "More importantly, it aims to ensure the safety of life and property in the southern provinces of our country," he added. "Recently new games are being played on our southern border. On the one hand, our supposedly allied countries have made promises to us but then on the other hand they place the PKK, YPG, PYD and Daesh terrorist organisations in the region." He said the operation in Syria’s northwestern Afrin region has been going on as planned. “We’ve made good progress so far in regards to Afrin, the Olive Branch Operation.” The presidential spokesman said the operation had three goals: securing the Turkish border, clearing the Syrian territories from the terrorist organizations and ensuring territorial integrity of Syria. “Everybody knows from the very beginning that PYD and YPG are the PKK. It is the same structure,” he reiterated. “They [YPG and PYD], have been a threat to our borders. We are still urging the Americans to stop working with them,” he added. 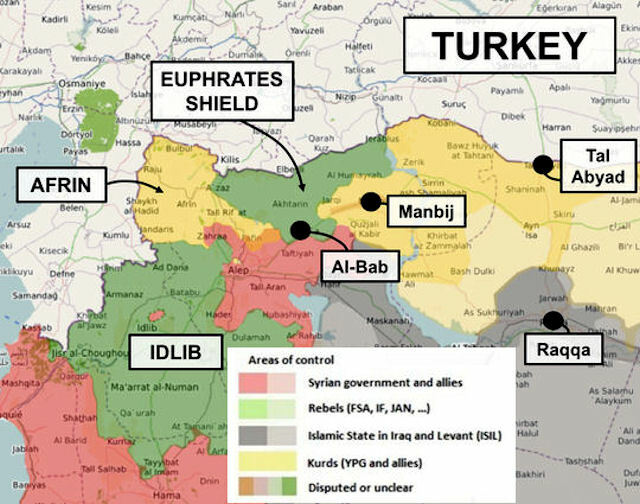 The Free Syrian Army announced 19 March 2018 that together with the Turkish military they have entered the northwestern Syrian town of Afrin as the YPG pulls out to regime-controlled areas south of the enclave. Turkish Armed Forces and the Free Syrian Army (FSA) entered Afrin town in northwestern Syria as YPG militants withdrew in the face of a Turkish-led border security mission. Marking the 103rd anniversary of a Turkish victory in the Battle of Gallipoli in the city of Canakkale, Turkish President Recep Tayyip Erdogan declared that the Turkish flag was now flying in Afrin's town center.